What Happened to the Apple Education Dominance of the 1980's? This morning, Apple made news by announcing its latest education initiatives that endeavor to turn iPads into academic hubs via media-enhanced textbooks and publishing tools for authors. Sure, the company we know and love (or loathe) today has long been making its way into schools all over the nation, using special pricing, Mac incentives for students, and pleas to textbook companies for more inventory — but it all got a bit more real this morning. People with short memories might say that this is Apple’s big push into education, however, I beg to differ. Today’s focus on education somehow reminded of my own years in high school and how I couldn’t go anywhere without seeing an Apple computer. It may be iPads this time around, but a very old and familiar feeling is creeping back in to my head when I think of Apple and schools. I graduated high school in 1989, and by the time I left those hallowed halls, my school was switching over to Microsoft-based machines. 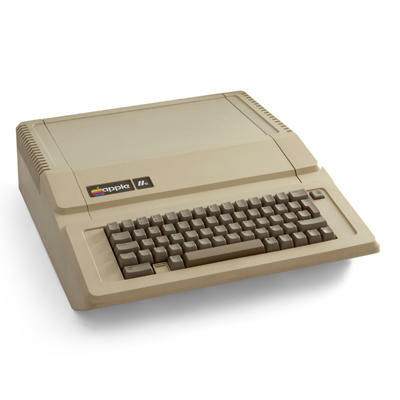 However, even as late as the spring of 1987, my high school was filled with Apple IIs like you see to the right: The library had a room filled with them, they used them in the office, in classrooms and just about everywhere else you can think of. While I used a Commodore 64 at home, my school had exactly one of those, and it sat collecting dust in the library computer room until I found a monitor for it and got it working again. The scenario was the same all across the country in that schools pretty much had Apple IIs and nothing else. So, what went wrong? Why did Apple hit the skids for so long and not begin to slowly creep its way back into schools again until the early part of this century? I had never really put two and two together until recently, but I am going to hazard a guess that it was a two-fold problem. The first was that Microsoft was on the rise with its policy of licensing its software to every manufacturer under the sun which forced competitive pricing. Schools want things on the cheap, and while Apple was the only way to get Apple-based products even back then, Microsoft machines were becoming more attractive due to the pricing. Secondly, and while no one really knew his name back then like they do today, it was the ouster of Steve Jobs from Apple in 1985. Many stories and books have been written about what happened now, but we all know Apple went off the rails during that time period, and it was obviously Jobs who spearheaded the effort to make sure his machines were in schools. With the return of Jobs to the company in 1996 to herald the Apple of today, it has been making its way into universities and grade schools all over the nation. He knew that if you capture customers when they’re young, they’re more likely to stick with what they know and are comfortable with. In other words, if Apple can get them using iPads in kindergarten, as they are now attempting with the new version of iBooks, they’re going to want to continue to use those the same familiar brand or platform once they’ve grown up and they head out into the workforce. Sure this is all idle speculation on my part, but when you look at the cycle of school dominance — hardly any presence to school dominance returning — it starts to make an odd bit of sense.